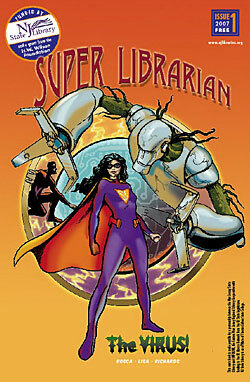 Free Comic Book Day–Highlighting "Super Librarian" Comic in NJ! The third phase of the Super Librarian campaign begins today, May 5, 2007, in conjunction with North America’s 6th Free Comic Book Day, a single day when participating comic book stores (find one near you) give away comic books for free to anyone who comes into their stores. It usually coincides with the release of a well-known superhero movie–and this year, it is Spider-Man 3 (can’t wait to see it myself later today–and yes, I got my tickets earlier this week!). So, come on into your local library today and see what’s happening–that’s what I am going to do in an hour. Check out the graphic novel section and if you are in NJ, get a free Super Librarian comic book. Invite a tween, teen, or an interested adult to go with you. Then you have my permission to go see Spider-Man 3! Entry filed under: Libraries. Tags: Free Comic Book Day, Super Librarian. Slides from NJLA Spring Conference	Change is inevitable. Growth is optional.